TAPS Pre-School, Elementary and Junior High School Departments are fully recognized by the Department of Education (DepEd) with Government Recognition No. : 07,s.2013; 08,s.2013 and J-25,s.2015 respectively. Senior High School was granted DepEd Permit with no: S-125s.2015, to offer STEM, HUMSS, GAS & ABM Strands. ​TAPS curricula have been prepared and tailored to prepare students to be the top performers in various learnings areas. These curricula have been approved by DepEd. 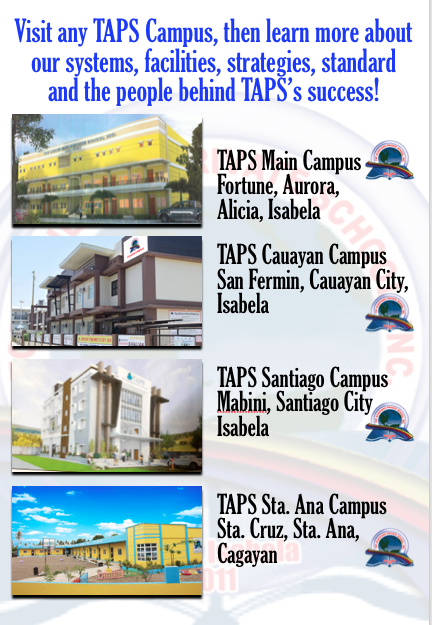 TAPS has been named as "The Most Hi-Tech School in the Philippines” and has been awarded as the "Most Innovative School in the Philippines," by the Bayan Academy, Knowledge Channel (of ABS-CBN), and Rex Publishing, Inc.; awarded with P300,000 on November 20, 2014 at Shangri-La Hotel, Manila. TAPS has been awarded as the Most Innovative School in terms of Delivery Methodology and Learning Effectiveness through the use of educational gadgets/technology. TAPS also has international consultants from other countries. Their experiences shall lead the school for the attainment of its vision, mission and goals. The teachers are high-caliber and have been considered as top performers in their respective fields of specialization. TAPS management implements policies which will benefit all pupils, faculty and staff, parents, and the whole TAPS community.